PathArc provides a simple way of specifying an arc that ends at a given position and uses the specified radius. It is modeled after the SVG elliptical arc command. Note that a single PathArc cannot be used to specify a circle. 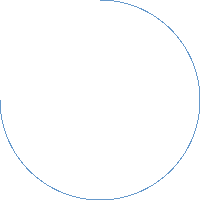 Instead, you can use two PathArc elements, each specifying half of the circle. 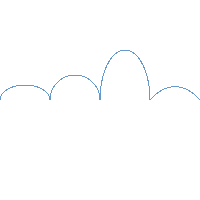 See also Path, PathLine, PathQuad, PathCubic, PathCurve, and PathSvg. Defines the direction of the arc. Possible values are PathArc.Clockwise (default) and PathArc.Counterclockwise. The following QML can produce either of the two illustrated arcs below by changing the value of direction. Defines the radius of the arc. Defines the end point of the arc relative to its start. 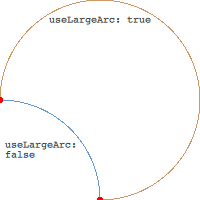 Whether to use a large arc as defined by the arc points. Given fixed start and end positions, radius, and direction, there are two possible arcs that can fit the data. useLargeArc is used to distinguish between these. For example, the following QML can produce either of the two illustrated arcs below by changing the value of useLargeArc. Defines the end point of the arc.